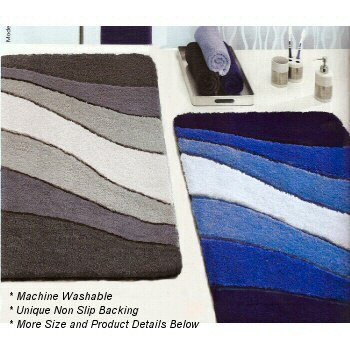 Modern bathroom rug design with sculpted wave pattern. Grey: Colors include dark grey, blue grey, silver grey and a soft flannel grey. Warm and cool grey tones give you more options for color coordination in your bathroom. The lid coordinates with the darkest tone in this design. Brick: Deep rich burnt sienna, earthy salmon, pale muted pink tone and soft light pale pink. The lid coordinates with the darkest color in this design. Royal Blue: Deep rich dark blue, bright blue, medium tone blue and soft medium to light blue. The lid coordinates with the darkest color in this design. Garnet Red: Deep rich garnet red / red burgundy, lighter tone burgundy, ruby red and a red tone that has a slight pink under tone. The lid coordinates with the darkest color in this design. Saffron: Bright fun bathroom rug with dark rusty orange, bright saffron orange, yellow orange and medium tone yellow. The lid coordinates with the bright saffron orange color in this rug design. Clover Green: Deep rich green / yellow, medium tone palm green, very light spring green and a very light yellow / green. The lid cover coordinates with the darkest color in this rug design. Ocean elongated lid covers are a solid color and coordinate with each rug swatch.